This post has been written for Week 4 of The Great Cake* Experiment. Why not take a look? If there is one thing I am grateful to the Great Cake* Experiment project for, it is that over the past few weeks since the adventure began, I have had to re-engage my cerebral muscles and put some thought into coming up with relevant posts. It’s been a while since I exercised my brain in a creative fashion, and I’m quickly coming to regard this time every week as a treat for the mind, a reward for more banal labours conducted over the course of the working week. This week, however, when trying to decide how to proceed, I drew a blank. Apart from the obvious, I didn’t come up with a clever narrative, or an engaging piece of fiction or even a tall tale of past conversations overheard (though I have, in my day heard one or two gems that would make your toes curl, oh yes). What I have realised, whilst racking my brains for some readable, even vote-winning wit, was that overhearing conversations features far more in our everyday lives than I’d ever realised. I tried to approach this post from a number of different angles. Firstly, I considered all the times I have been stuck on some mode or other of public transport, hemmed in tight between the window, and my (due to my luck/irresistable magnetism, usually malodourous and/or oversized) co-passenger, listening to some imbecile four seats ahead regaling the bus or train with inane details of her holidays/family wedding, or some suit with an over-inflated ego asserting his authority over an unfortunate junior colleague within full earshot of at least three counties. Upon recalling these occasions, and comparing these assaults on my eardrums with the agony I feel every time I find myself pumping cash into the bottomless money pit that is my car, I feel vindicated in my decision to reject long-haul journeys on public transport and drive everywhere. (By ‘long-haul’ I mean anything that takes more than 30 minutes, and/or involves any kind of changeover). I’m convinced there is some mathematical formula or theorem of relativity dictating that the more inane the event being discussed, the higher the decibel level needed to discuss it. I firmly believe there should be some sort of (preferably painful) penalty imposed on such inconsiderate individuals for their complete disregard for the comfort and sanity of their fellow travellers and their unashamed levels of oblivion to resulting glares cast in their direction. I considered re-telling one of these overheard tales as the basis for my post, but frankly, they were clearly all so mind-numbingly dull that I couldn’t recall any. Secondly, I considered the angle of the conversation overheard in public toilet cubicles. I’m sure most of us at some stage of our lives have fallen victim to one of these overheard tête-à-têtes while we going about our business. Depending on the time of day, the location and often the amount of alcohol imbibed by the participants, the performance can provide varying levels of entertainment. Sometimes, you may even wish to join in, and again, depending on the measure of alcohol consumed, your opinion may even be welcomed enthusiastically (but only if the conversation is centring on some other poor unfortunate, and you are in agreement with the popular opinion.) The unfortunate downside of overheard conversations like these is that one wretched day as you are having some ‘you’ time in a toilet cubicle, you may find yourself as the subject, and the tone may not be generous, and no-one needs me to tell them how unpleasant that can be. If you do ever find yourself in such an awkward position, I would heartily recommend that, rather than sit there sobbing into the toilet roll and waiting for the perpetrators to leave so you can plot your spiteful revenge in a cloud of victimhood and self-pity, you should quite brazenly march out there, wash your hands and join right in, and take gleeful pleasure in the discomfort of the instigators as they frantically attempt to backtrack. It is comforting to remember that in all likelihood, unless you are 16 years old, and are ensconced in the toilet cubicle for the sole purpose of consuming an illicit, smuggled naggin of vodka at a teenage disco, you are unlikely to find yourself in such a challenging situation, but in this day and age, you can never be too prepared. I also, while searching for inspiration recalled times, many years ago – back in the Dark Ages, I think – where no-one owned a mobile phone, and conversations with friends and love interests could only be conducted either face-to-face or via the house landline. In my home, an extension line in the bedroom provided ample opportunity for an impatient parent to pick up the handset and interrupt either a riveting blow-by-blow analysis of the day at school or the whisperings of sweet romantic nothings from a new boyfriend by bellowing down the line from the other end of the house in a last-ditch effort to regain use of the line for more pressing matters. Recalling the calibre and cringe level of these overheard conversations, how I gaze enviously now upon my fifteen year-old sister with the array of communications gadgets she has at her disposal. I considered the ‘voyeuristic’ nature of eavesdropping (what’s the aural equivalent of voyeuristic?). I contemplated the vast array of narrative and film that includes elements of eavesdropping. Shakespeare used the concept to great effect in many of his works, and he wasn’t alone. 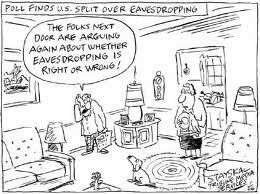 I learned that there are entire published academic papers dedicated to the psychology of eavesdropping. I reflected on the myriad of websites devoted to witticisms overheard – take Overheard in Dublin as a prime example of a wealth of bizarre titbits of conversations overheard in this unfair city). I even remembered the kick I’d get while standing on the terraces at a GAA match and savouring the razor-sharp banter between supporters (indeed, had I thought of this earlier in the evening, I could have written a short novel based on the belly laughs this has given me over the years). I wondered if we are all gossips at heart. Indeed, it dawned on me just how much of the information we glean on a daily basis stems from overheard conversations and made me conscious of my own behaviour in that regard. However, the thing that struck me most is that I never, until now realised just how much – whether we like to admit it or not – we all enjoy the occasional eavesdrop.